Doha, April 4, 2018 – Sir Mark Moody-Stuart, Chairman of the UN Global Compact Foundation and former Chairman of Royal Dutch Shell, led the Selection Committee for the 6th Abdullah Bin Hamad Al-Attiyah International Energy Awards for Lifetime Achievement and was joined by five other distinguished individuals. The Al-Attiyah International Energy Awards are given annually to individuals for their Lifetime Achievement in the advancement of the global energy industry in seven categories. 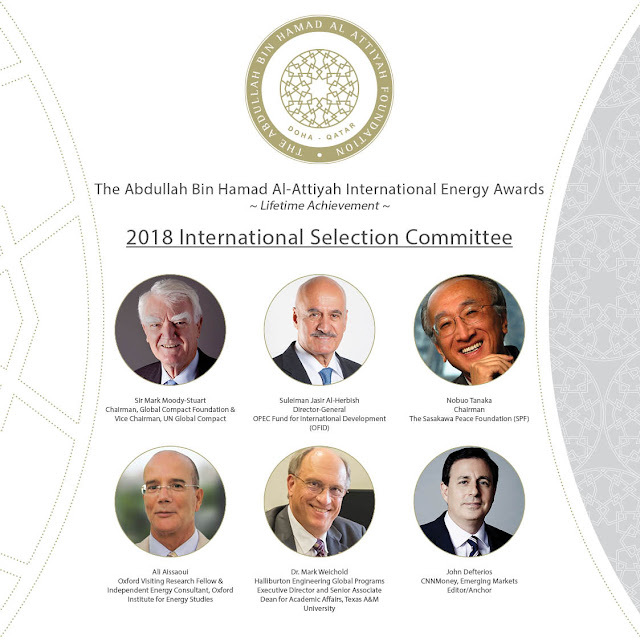 The nominees are voted on by an International Selection Committee who reward candidates for an outstanding record of accomplishment in their sector over the whole of a career of at least 30 years, men and women who have made an exceptional impact on the energy industry with distinct personal achievements for a consistent and prolonged period of engagement. The Al-Attiyah International Energy Awards celebrate the legacy of H.E. Al-Attiyah, Chairman of the Al-Attiyah Foundation, Qatar’s former Minister of Energy & Industry and Deputy Prime Minister, by recognizing the career achievements of distinguished individuals in service of the global energy industry. "It is a great honor to be on the Selection Committee celebrating the awards from the Abdullah bin Hamad Al-Attiyah International Foundation, especially given that His Excellency Al-Attiyah has himself contributed so much to his country, OPEC and the industry," said Sir Mark Moody-Stuart. The Al- Attiyah Foundation strives to ensure that the worthiest nominees globally are identified for their outstanding record of accomplishment in their category. In order to achieve this, a group of renowned figures are invited annually to join the Selection Committee to independently evaluate the nominees based on the following Criteria: Impact, Innovation, Long-Term Vision, and Leadership. Sir Mark was joined on the International Selection Committee by Ali Aissaoui, Oxford Visiting Research Fellow & Independent Energy Consultant, Oxford Institute; John Defterios, Emerging Markets Editor/Anchor, CNNMoney; Dr. Mark Weichold, Executive Director, Halliburton Engineering Global Programs and Senior Associate Dean for Academic Affairs, Texas A&M University, and Nobuo Tanaka, Former Executive Director of the IEA and Chairman of the Sasakawa Peace Foundation. "His Excellency Al-Attiyah’s commitment to keeping producers and consumers united through various platforms shows his continued commitment to ensuring sustainable and secure energy supply for the future," said Tanaka. The 2018 Winners will be presented their Awards at a Gala Dinner event held at the Museum of Islamic Art, Doha on May 7th, supported by Qatar Petroleum, Qatargas, North Oil Company, ExxonMobil, and Shell.